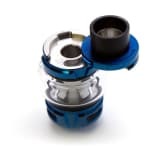 The TFV8 Baby V2 tank from SMOK features a patented press button locking mechanism effectively that prevents leaks while the new underside gasket design provides a cleaner look. 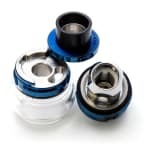 The Baby V2 also introduces a new mesh coil series (not compatible with other TFV8 tanks) focused on flavor and cloud production, including an A1 0.17Ω single core mesh coil rated for 90 - 140W and an A2 0.2Ω double core coil rated for 50 - 80W (sold separately, available here). The TFV8 Baby V2 tank from SMOK combines all of the latest advancements. A patented press button locking mechanism effectively prevents leaks while the new underside gasket design provides a cleaner look. 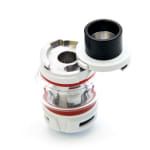 The 30mm wide bubble glass tank provides a 5mL e-liquid capacity, and the spare standard tank glass allows for 2mL. 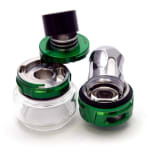 The 16mm wide drip tip has substancial mouth feel and triple adjustable airflow channels allow for customization of the draw. 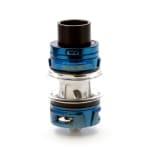 The Baby V2 also introduces a new mesh coil series (not compatible with other TFV8 tanks) focused on flavor and cloud production, including an A1 0.17Ω single core mesh coil rated for 90 - 140W and an A2 0.2Ω double core coil rated for 50 - 80W (sold separately, available here). 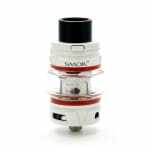 NOTE: not compatible with TFV8 Baby Beast coils.